If you’ve ever wondered who equipment companies rely on to test and critique new products, they’re among you. 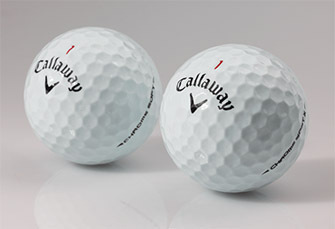 Callaway Golf Company released new versions of its Chrome Soft and Chrome Soft X golf balls at the beginning of the year, and AmateurGolf.com’s equipment panel played a key role in providing feedback about how the ball suits competitive amateurs. The AGC equipment panel is made up of a select group of competitive amateur golfers ranging from club champions to USGA champions. More than half of the panel selected to put the Callaway balls in play log over 76 rounds per year, and 64 percent have a 5 handicap or better (26 percent of those players being scratch or better). It was a sophisticated group of testers, with roughly two thirds falling into the over-40 age category. A group 100 panelists received a shipment of six Chrome Soft and six Chrome Soft X golf balls. The products hit the fairways in force over the summer, and as results trickled in, our panel painted a picture of a golf ball that was durable to play without sacrificing feel around the greens. 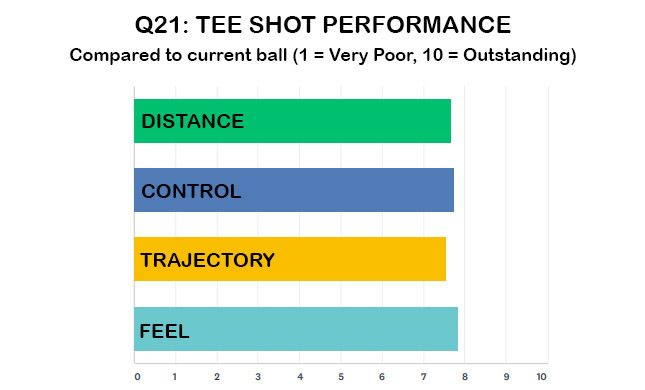 Testers were asked to rate the ball using a series of questions about its performance on various shots and on different parts of the course. The Chrome Soft X scored a 7.9 (on a scale where 1=very poor and 10=outstanding) in distance off the tee and an 8.04 in distance with irons when compared to the tester’s current ball. The Chrome Soft, meanwhile, scored highest in feel when compared to the player’s current ball across all parts of the course -- with a driver and irons, when hitting half shots and when putting. That feedback is consistent with what Callaway intended for this ball. When new versions of the ball were released at the start of the year, Callaway reported that the focus of its update was on key features like distance and control through the bag, an ultra-soft feel and forgiveness, among other qualities. Our 100-player survey group reported putting a premium on feel, distance, spin and trajectory when selecting a golf ball. The Chrome Soft models are an especially good fit for players who like to spin the ball around the green -- several testers touched on the topic. More specific feedback is broken down below according to each model. Even though feel stood out most to our panelists when they put the Chrome Soft in play, many also discussed trajectory and distance off the tee. Consideration for distance, control, trajectory and feel were the closest in the iron-shots category. 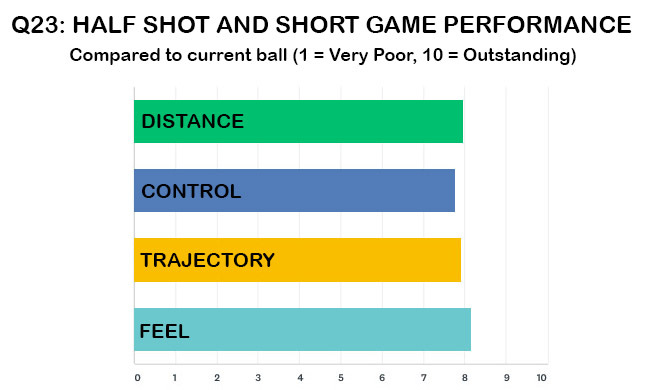 Every aspect exceeded a 7 on the 10-point scale (1=very poor, 10=outstanding) panelists used to evaluate the ball’s performance. Feel and trajectory won out, but only slightly. Multiple respondents named as a positive the Chrome Soft’s feeling from the rough and the fairway with an iron in hand. Shots around the green – and even on shorter par 3s -- felt very responsive to our player panel. Around the greens, players once again went back to feel – in firmness, roll and even sound off the putter. Others loved the ball’s durability, and the fact that feel wasn’t compromised to achieve that. In the end, those were the most attractive features to competitive amateurs. Asked to compare the Chrome Soft X off the tee against their current ball, respondents were most impressed with the ball’s distance. 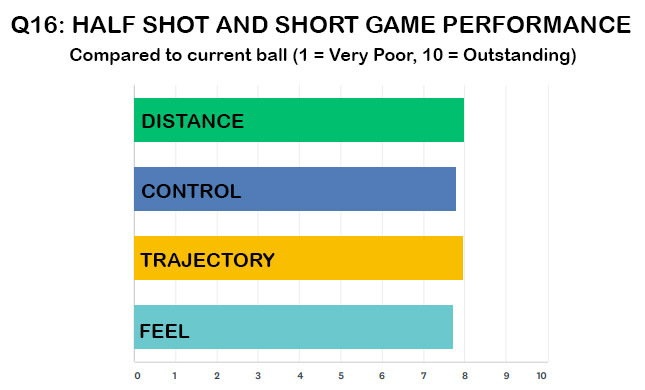 They scored the ball as a 7.9 on the 10-point scale (1=very poor, 10=outstanding). Several testers described a solid feel at impact, and reported getting similar distance out of the ball as they would get from other balls. One tester described the feeling of the Chrome Soft X changing as you move through the bag – firm off the tee but gradually feeling softer with irons and softer still on the putting green. The Chrome Soft X also received the highest marks in distance with iron shots. Feedback regarding shots around the green – from half shots to chips and even putting – was universally positive with the Chrome Soft X. The high-level amateurs who put this ball in play reported a comfortable feel that allowed for considerable spin without a loss of control. Some testers felt the Chrome Soft X was easier to control than the Chrome Soft. That and firmness (the Chrome Soft felt softer to our panel) were the two most reported differences between the models. “I was able to make the ball skip and check or stop on a dime when the correct shot was hit. This category is where I believe the ball performed the best. It felt great around the greens and on the putting surface,” one tester wrote about the Chrome Soft.